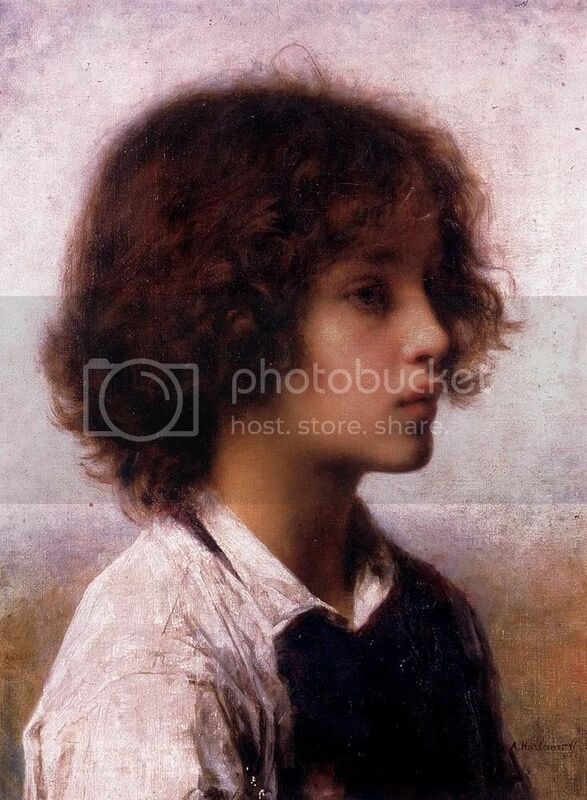 ~ detail from Harlamoff's "Faraway Thoughts"
With child-Frodo in mind, I find Harlamoff's painting very aptly named: "Faraway thoughts". Perhaps he is imagining exciting future adventures? No, he looks too pensive for that. Perhaps he is thinking about the past? That is more like it. In jan-u-wine's "A Hobbit's Bedtime Story", Frodo, still a lad, is remembering bedtimes past, when his mother and father were still alive, presiding over the nightly rituals of getting their beloved boy ready for sleep. It's not a long poem, but very evocative. I feel as though I am there with him, seeing his parents, feeling their touch, hearing their voices. And I love the enigmatic last line. To whom is Frodo speaking? One can only imagine. Applicability is a lovely thing. Faraway Thoughts by Alexei Alexeivich Harlamoff. It was not so long ago that I was a lad. how it was, of an evening. on the board just above my head. upon the bench beside the door. nor tell tales of the wide world, like Gandalf. and we would sit quiet. we'd go in, Da's hand warm about mine. My nightshirt would be by the fire. when she rocked me as a babe. as close as if she held me to her own heart. And now, I have given one to you. Good-night, my dear, and good dreams. .......I hope that all of you that responded to "She" won't find it rude that I thank you en masse. RL has been....overwhelming for a while now (and many of you know how I tend to just run on and on, anyway, so it makes sense to spare you my wanderings). This "thank-you", then, is more than simple appreciation. What should I, could I, call it? A gratitude of the heart? Seems too simple, still, to communicate my intent. But that is all I have to give you, in gratitude, indeed, for your words. I would also like to thank Mechtild: her love of LOTR continues, her brilliance at choosing apt art for the posts and writing wonderful intros remains not only intact, but grows 'in the telling'. And she's kind and patient with her collaborator, whose word-train oft runs off the rails. It means a lot to be so blessed. She is a jool amongst friends. ~ jan-u-wine's "She", plus detail from Gustav Klimt's "Three Ages of Woman", 9-21-10. I continue to love the collaboration of painting and poems. They are both always beautiful and perfectly complementary. Mews, I am so pleased the painting worked with the poem. It really is a tender, lovely portrait, as is the poem, as you say. Well, what can I say but another great poem and love the art also. And if this collaboration brings more and new masterpieces, than yahoo! :) What strongly struck me is the single star on the headbeard - I thought immediately of the lonely star in the marvelous song at the end of the BBC Radio adaptation and a foreshadowing, though no one knows that at the time, of Frodo's home to come. Love also the love in here between parents and child. Thank you! What a lovely pic Mechtild - whether male or female it definitely brings young Frodo to mind! Thanks, Paulie. I'm so glad you enjoyed the poem and painting. I am loving this little series of "parent poems". Your combined voices give us stories too.